For the last couple of months, we had the opportunity to contribute to - and sponsor - the creation of a major new White Paper from the international VR/AR Association that explores the positive and lasting impact that Virtual Reality and Augmented Reality technologies can have when businesses deploy them to generate substantial revenue, increase productivity or improve safety. 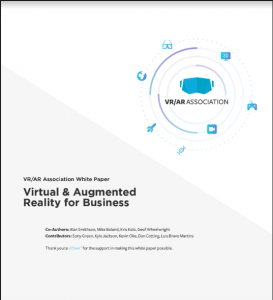 That White Paper, which was co-written by 9 industry experts and the VR/AR Association's Enterprise Committee, is now available for download here. The White Paper explores the idea that Virtual & Augmented Reality are immersive technologies that provide new and powerful ways for people to generate, use and interact with digital information. It looks at how these technologies take traditional media beyond conventional screens and use photographic images, video or computer generated graphics (sometimes provided as a 360-degree view within your field of vision) as a new communication and interaction medium that can be used across your company from marketing and sales to field services, training and data visualization. Companies such Walmart, Farmers Insurance and Boeing have already begun deploying this technology across their organizations for training. Specific examples of how other brands are using VR/AR right now are detailed in this paper. Whether you are a brand marketer, director of operations, run a line of business or head of HR, there are many ways you can deploy this technology to generate substantial revenue, increase productivity or improve safety. Enterprise XR growth will also result from the sector’s composition of hardware and software. Near-term revenue will be hardware-dominant as it’s usually the first step in enterprise tech adoption. But that will create an installed base for software which will gain share of enterprise XR in outer years. IDC supported this conclusion in a recent report. "We have long believed that AR headsets will play a fundamental role in changing the way many companies do business in the near future and we are increasingly seeing the commercial use cases for VR unfold," said Ryan Reith, program vice president with IDC's Worldwide Quarterly Mobile Device Trackers in IDC’s recent Augmented and Virtual Reality Headset Tracker report. "AR will introduce technology to a large portion of the work force that was never able to benefit from technological advances because of the need to use their hands to complete their job functionality. AR will change all that. And within VR, the commercial use cases that are emerging the fastest are within education, design/content creation, and retail, and we have strong reason to believe this is just the tip of the iceberg."